Hand carved solid marble mortar and pestle from Thailand. Dimensions: 5 5/8 x 3 3/4 Weight: 5 lbs. 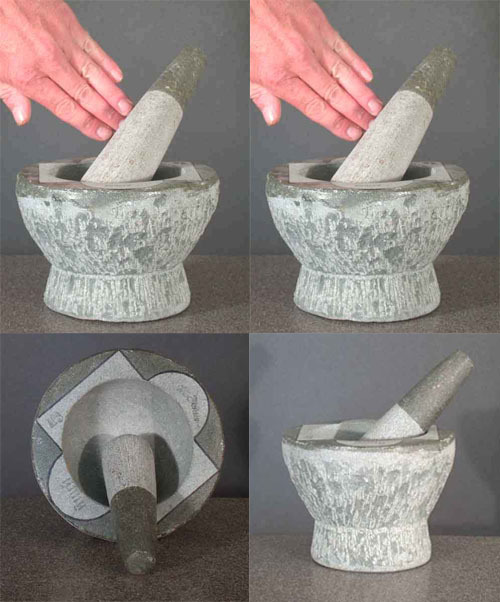 This is a hand carved marble mortar and pestle from Thailand. I have these specially made and you will not find them anywhere else. These are solid marble with beautiful, soft gray tones. This beautiful hand crafted motar & pestal looks great in the kitchen and is a must for creative food preparation.